The TA12 has an aerating width of 48" to give you the extra capability to handle just about any situation. Two independent tine rotors with 40 interchangeable closed spoon 1/2" tines provide superior maneuverability around corners and tight areas. Six optional weight containers ensure optimal soil penetration. Tip wheels allow the TA12 to easily pass through narrow openings. The rugged design of these aerators offers years of low-maintenance productivity. 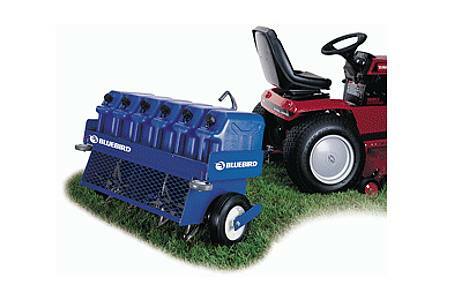 Aerating width: 121.92 cm / 48 in. Aerating depth: 0-76.2 mm / 0-3 in. Aerating pattern: 121.92 x 152.4 mm / 4.8 x 6 in. Detachable weights: Optional weight containers sold separately. Product size, LxWxH: 142.24 x 148.59 x 94.23 cm / 56 x 58.5 x 37.1 in. Weight (less fuel/water containers): 100.7 kg / 222 lb.